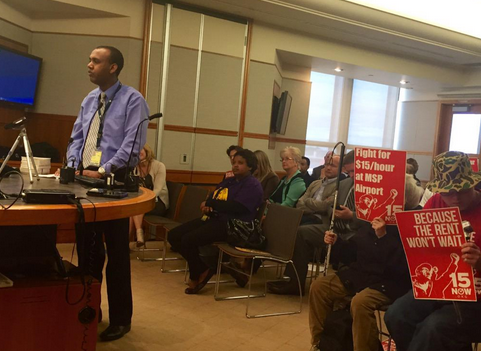 On Monday May 18th, the Metropolitan Airport Commission (MAC) voted on a $1 wage increase for around 3,000 low-wage workers at the Minneapolis- St. Paul Airport. 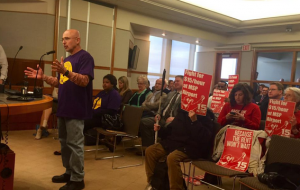 The MAC will return to the June meeting to vote on the implementation plan of the increase, slated to begin in August at the same time as Minnesota’s statewide minimum wage increase. This small victory sets an important precedent as the first local government body in Minnesota to raise wages, opening the door to Minneapolis and beyond. Airport workers, 15 Now, the Service Employees International Union, Teamsters and other unions packed the meeting to demand the MAC return in June with a proposal for $15/hour. 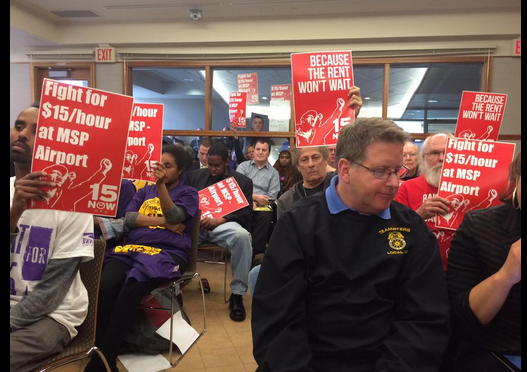 MSP – Airport workers have organized demonstrations, rallies, and a broad community campaign for $15/hour over the last 10 months, which has been endorsed by Representative Keith Ellison and the Minnesota AFL-CIO. Abera Siyoum, a low-wage Air Serv worker, addressed the MAC with hundreds of union cards signed by his co-workers who are organizing for representation with the Service Employees International Union Local 26. “This $1 increase will not help my co-workers get off welfare. I’m tired of poverty pay and this increase will not help me spend more time with my family and pay my bills,” Siyoum said. Over the last 15 years, wages at the airport have fallen 45% as airlines outsource work to subcontractors who relentlessly drive down wages in an effort to increase profits. Rising labor unrest against this is the main reason that, in February, Governor Dayton appointed two rank and file airport workers to the MAC, including low-wage Air Serv worker Ibrahim Mohamed. At Mohamed’s inauguration ceremony, Dayton said, “The fact that he was making $12.50 an hour a few years ago, according to reports, and they reduced that to minimum wage is just disgraceful.” The current proposal for $10/hour would not even raise workers like Mohamed back to their previous salaries. Advocates have also pointed out how poverty wages at MSP Airport disproportionately affect the East African community, which reinforces Minneapolis’ record as one of the most racially unequal cities in the country. A recent report by the Center for Popular Democracy, Waiting for Take-off, shows how a $15/hour minimum wage at MSP Airport would put $25 million into the East African community annually, adding nearly $10 million in tax revenue for the local economy. MSP Airport is one of the most profitable airports in the country. 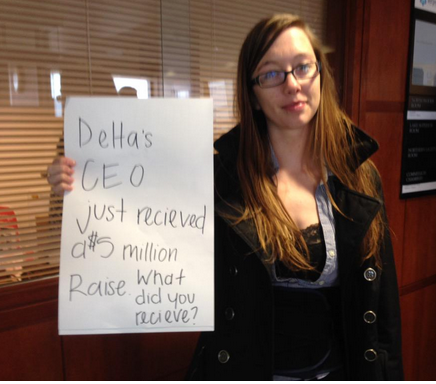 Delta Airlines boasts that 25 to 30% of its total profits come from MSP Airport, partially because of widespread use of low-wage subcontractors. “Out of his own salary, Delta CEO Richard Anderson could pay 460 workers $15/hour,” said Kip Hedges, a former Delta baggage handler who was fired in December for supporting $15/hour. The proposal passed with an amendment to study the impact of a quality service wage, which could raise wages for these same workers to around $15/hour. A MAC vote on the quality service wage will require a mobilization of workers organizing for $15/hour increasing pressure on the MAC leading up to the June vote. Fired Delta baggage handler, labor and 15 Now organizer Kip Hedges addressed the MAC. “The MAC is discussing wage increases because of the pressure airport workers have escalated around the demand for $15. The MAC has a clear choice. 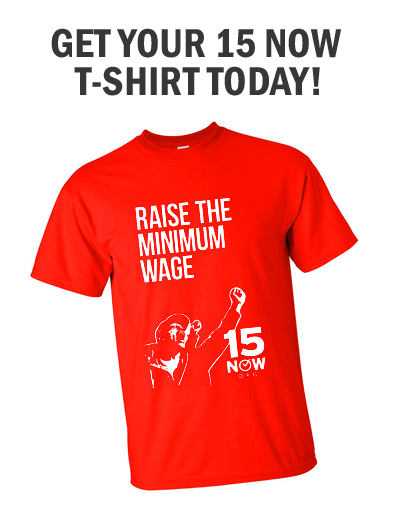 Either it takes action to have a positive effect on the lives of thousands of MSP workers by passing $15/hour, or it caves to the corporate trade groups like Airlines for America, allowing Delta and other companies to continue outsourcing Minneapolis workers to poverty wage employers,” said 15 Now MN organizer Ginger Jentzen.